The 2017 Wimbledon tournament has fininshed and we have a winner: Roger Federer. With this win, he has a total of 8, being the man with more wins at the All England Club. Today, as we are the Official Providers of Wimbledon Tennis Balls, we would like to talk about the legend of the tournament. Roger Federer was born in Basel, Switzerland, the August 8th of 1981. He started playing seriously in 1998 in the juniors tournaments, being winner of four of them including, of course, the 1998 Wimbledon Junior Tournament. Federer entered the top 100 ATP ranking in 20 september 1999, and his first final came at the Marseille Open in 2000, but he lost against Marc Rosset. 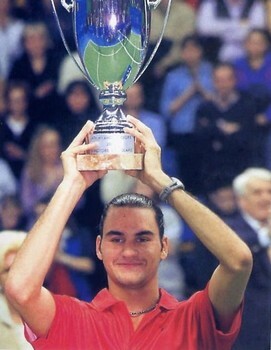 It was in the 2001 Milan Indoor tournament when the first singles win came, defeating Julien Boutler in the final. In 2002, he won his first Master Series event at Hamburg, defeating Marat Safin and puting him in the top 10 for the first time. Also in 2002, his won the four-time defending Wimbledon champion Pete Sampras at the All England Club, reaching the quarterfinals for the first time. A year later, he won his first Grand Slam at Wimbledon, and other 7 seven important tournaments, making it his first great year. He ended 2003 being the number 2 of the ATP Ranking. 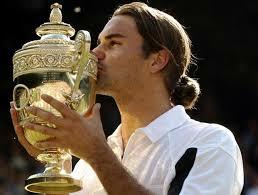 In 2004, he won 3 out of 4 Grand Slam, and reached the number one of the ATP Ranking for the first time. Although he has never won the singles tournament, he also is an Olympic Champion, as the won the doubles tournament at the 2008 Beijing summer Olympics with Stan Wawrinka. After those years, Roger Federer’s career has been more than succesful. He hold several records that are hard to beat and probably will hold for a long long time. For example, the record that makes him a Wimbledon legend: he has won it 8 times, and no active player is even near to those. He also hold the record of most singles Grand Slams wins, 19 with the last Wimbledon win, no one has played more finals than him, 29. 10 of those finals there in a row, being also the record. He has reached all 4 finals in a year 3 times, and is also the only one to have won 3 Grand Slams on the same year also 3 times. About the ATP Ranking, he hold the record of most weeks being the number 1, a total of 302. The record of most weeks in a row is also his, with 237. These all are records that he hold alone and, as we said, no active player is near on any of them.